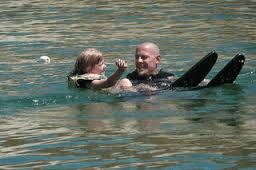 Water skiing is a really fun summertime activity. 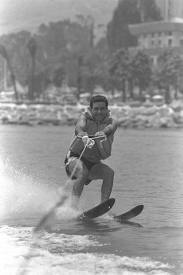 If you have ever wanted to learn how to water ski, this article is a good place to start. Learning can be kind of intimidating for beginners. However, with the right gear and a little technique and know how, anyone can do it! Before you get on the water, you will need some skis and a life vest. You can find coast guard approved life vests starting for around $20. Water skis can be much more expensive. Skis with broad tips are best for beginners because they are easier to balance. You can find them at sporting good stores or pro-shops. You should talk to a knowledgeable sales associate to help you find the right skis for you in your price range. To start skiing, put on your vest and skis and get into the water. Float on your back in the water in a kind of sitting position with your knees bent. Your weight should be focused to the back of the skis and the tips of the skis should be sticking out of the water. Grab hold of the rope handle in between the skis; it should be slack before the boat starts moving. Once you are ready, signal to the boat driver to go. As the boat starts to go the rope will tighten and pull you up. Try to stand up, keep your arms and back straight, but keep your knees bent around 70 degrees. This will help to keep your balance and absorb any bumps. Once you get used to it you can straighten up your knees more. It can be tricky for beginners to maintain their balance, but if you do it right you will start to glide on the top of the water. Beginners should try to stay behind the boat in its wake. To turn simply shift your weight in the direction you want to move. If you don’t get it the first time, keep trying. 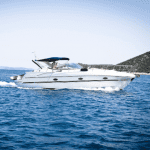 Always try to maintain a relaxed stance while you’re leaning back, and allow the boat to pull you up. Once you’re ready to stop, simply sit on the skis and let go of the rope. This will allow you to glide to a stop. So now you have an idea of the basics of skiing. Once you master the basics you can try some harder maneuvers and tricks! Good luck but most importantly remember to have fun out there!